On a recent safari conducted by another company, the guide informed us that the most populous bird in the world is the Red-billed Quelea, Quelea Quelea. I am not sure of this as I reckon the domestic chicken wins that title. He probably meant undomesticated flying bird. What prompted this guide to say this was the appearance of a HUGE flock of around 5000 Queleas. In Kruger Park the Quelea forms large flocks mainly in the dry period. 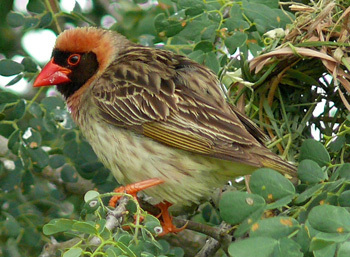 The name originates from the Swahili language and, indeed, the Quelea is restricted to sub-Saharan Africa. It can cause great damage to commercial cereal crops such as millet and wheat. It is known as the “feathered locust” in some parts of Africa and is routinely killed in great numbers using avicides which are sprayed over roosting colonies. It would be far better to harvest these birds and supply some protein to some of Africa’s hungry populations. Thinking about hungry, I went to Satara Camp in Kruger Park to establish precisely why the restaurants are not performing satisfactorily. Apparently there is a dispute between the two franchises and SA National Parks. The result is that electricity has been cut off to the restaurants. Satara management has solved the (hopefully temporary) problem by engaging an enterprising local group that provides traditional fare. I was very pleased with my complimentary plate of putu (pap or white maize polenta), chicken and marogh (a type of spinach). Our guests too were pleased with their meals. More importantly the guests were EXTREMELY pleased with the game viewing. In fact, on the day I went to Satara, 28 Sept 17, our guides Nico and Patrick had shown the lucky guests the Big Five and Cheetah and Wild Dog by lunch time !!!! WOW !!! On our way to a bushwalk, Raymond and I stopped and watched impalas – they were looking around, alarm snorting and so we knew that something was up. We looked closer and discovered 3 lionesses coming towards us – we watched them as they crossed the road in front of us. We also found some elephants on the road that very same morning. We started our bushwalk and on our way to the Hippos we found some smelly Waterbuck – they releases their scent …. smells a bit like turpentine. 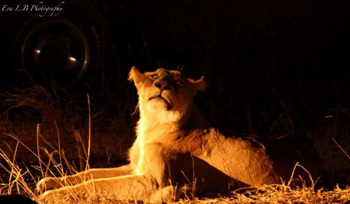 Beautiful photo of spotlit lioness. As we started walking into the bush, Raymond and I heard some breaking branches, and sure enough, we found a bull elephant on a nearby hill. Raymond and I quickly made a plan, (we could hear more disturbances) to move our guests. We didn’t have any more visuals but could hear branches cracking all around us. We don’t like being surrounded so we walked to a higher place where we managed to get some visuals. We saw a total of 6 Bull elephants on a hill. We could also hear 2 bull Hippos fighting, and that was loud and definitely priceless to me. We also find some Kudus, baboons playing with each other, some bushbucks « barking » at us. It was a very interesting walk. Out early morning, the bush can’t wait or perhaps I can’t wait for the bush, we are driving, it was cold we are waiting for the sun to come up. We found some Lions tracks going on to Barnard and off we went in search of them. 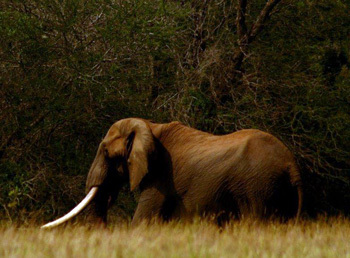 We didn’t find lions – instead 4 bull elephants. With children under 12 not allowed on Bush walks, we then do a long morning drive. I had a family of 6 including young children. The kids behaved better than the adults at the sightings. As we entered Campfire property we found some elephant bulls busy feeding. We got radio called to a lion sighting. It was 2 big males, lying down in the shade. As we drove toward one of my best favourite spots, we found this incredibly cute Mother and calf black rhino. These guys are so endangered and I felt really privileged. She is very nervous but especially she is curious. Sundowner will forever be my favourite drive of all, because we get to spend even more time with our guests, it makes it more intimate and you have plenty time to explain a lot. This month I had a fabulous couple from America hopping in « Doris » my landcruiser – in our first half an hour we found about 20 bull elephants. That day we were surrounded : « Traffic Jam » Then I was chit-chatting with some other guides and so we made our way to a Lion sighting. It was 2 big males lions lying down, lazy as usual. We had a pretty clear view. I told my guests to get ready because the boys were about to roar for us. They put on a show for us that evening. We stopped for drinks and snacks on the airstrip for a breathtaking sunset. I then took a long route back to the lodge and so we found a little Chameleon in a tree. All of a sudden I spotted a weird pair of eyes, decided to reverse and what a surprise : the 3 lionesses we had seen in the morning crossed again right in front of us. Even if we have 3 vehicles going out, it doesn’t mean that we will all choose the same route. I usually have my own routine. When we get to the Boma for Bush BBQ it is interesting to hear what the others saw. Some saw Lions, some a Black Rhino and we saw hippos out of the water. This month has been full of surprises even though the bush is so dry and so open. As we were about an hour into the drive, I received a phone call from Pretty our Hostess to tell that there were lions lying down at the waterhole at Marula Boma. – we were very, very, very far away from the Boma, so we made our way there, a little faster than normal but at least I didn’t lose any guests, knowing our GM dislikes the idea of ‘Ferrari safari’. As we arrived at the Boma we found 3 lionesses lying down in the grass about maybe 30 metres away. Never a dull moment in the bush. 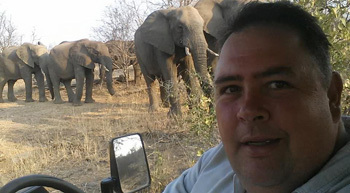 Hello – it’s happening again at Tremisana Lodge : I was doing a sunset drive along Marula Road and we saw impalas, giraffes and kudu and just before we reached Sable Road we saw a large breeding herd of elephants. It was good and a little scary to have the mothers and calves all around us. On another day, we saw elephants, impalas, waterbuck and 2 male lions lying down being lazy. While we’re eating our delicious BBQ at Marula Boma we saw honey badgers and a genet cat – it was amazing. On our Bush Walks, we drive to the river and we always see impalas, hippos and crocodiles. Often we see the elephants and buffalo that’s why we are very careful about the bushwalks – it needs someone who knows what to do to protect the clients. I did a sleep out safari on the platform at Marula Boma with my guests – it was really marvellous – we heard lions roaring warning the other lions that this is their territory. It was amazing to see the stars – my guests were very happy !! They also appreciated the beautiful sunset. 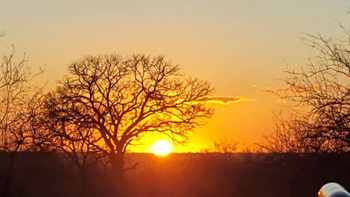 Beautiful Sunset at Marula Boma. This month has been filled with amazing sightings and lots of excitement. Our spring season has started as we can see it in the weather patterns as well as a slight change in the animal sightings. I have encountered multiple plains game on my morning drives such as Impala; Kudu; lots and lots of Giraffe as well as the occasional Zebra. On the morning drives we just do a short route but some days you can be amazed with what you find in that 1.25 hours. It is a lovely drive and a wonderful crisp way to wake up early in the morning. My afternoon Drives have been exceptionally good : we have had the Big Five right through to the little Steenbok and Tree monitors. The most special moments to me being when I found Ezulwini the Tusker on Billy’s Lodge making his way to the spruit and also spotting the large male Leopard lying under a Nyala tree on an old termite mound; first thinking it was a log but curiosity had the better of me and as I stared a little longer – I found those beautiful eyes looking right at me. Leopard sightings are truly one of my favourites as it is so rare to find them especially with such relaxed behaviour – truly breathtaking experiences. We have had multiple Lion sightings of which the two Black Maned Males stood out for me next to Ingwenya Dam. We also managed to spot a black Rhino and her calf. I have been on multiple sunset drives this month and have had excellent sightings. Two black maned male lions calling into the night; large herds of Elephant; Buffalo and White Rhino at Marula Boma and plenty nocturnal visitors such as hyena; honey-badgers; porcupines etc – truly amazing experiences that will not be forgotten. I have had amazing sightings of lions mating and two male lions just relaxing next to the dam as well as multiple elephant sightings. It has only been amazing experiences that I am overjoyed to share with my guests. 04/09/17: Kruger : About 2 kilometres from the gate 20 lions killed a buffalo. Pelwane riverbed produced white rhino, elephants and buffalo. On the H-7 road near Nsemani leopard with kill. 05/09/12: Near Girvana we saw two male cheetahs chasing impala. Close to Timbavati bird hide there was a big leopard with an impala kill in an apple leaf tree; Crocodiles out the water – about 12. 12/09/17: Kruger was hot but we managed to see all of the big five. H-7 three rhinos. 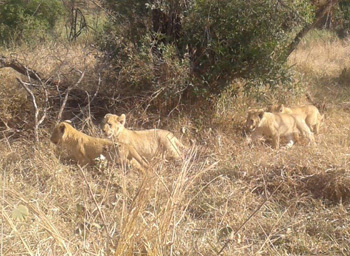 S-41 we had brilliant sightings of twenty one lions which are called Lebombo pride where there’s one White Lion. Buffalo Gudzani dam also elephants drinking water. 14/09/17: GREAT sighting of one dominant bull Rhino along Rabelais – near a breeding herd of more than 70 buffalo. On our way back we had a large female Hyena cross the road. 19/09/17: Before reaching reception we found two leopards in the middle of the road; a mating pair of lions after Orpen. Buffalos at the watering-hole; at morula junction there were fourteen Wild Dogs with blood on their mouths; a leopard stalking impalas at Nnwanetsi Bridge. H1-4 new road there was a nice sighting of 8 lions under a fig tree – then a breeding herd of elephant came and chased them. H-7 leopard before Ngwanatsatsa bridge; 21 lions S-41 with one a white lion. On the way back we found one Male rhino near Orpen, buffalo S-100 before Xibotwana more than 200 elephants next to Sweni junction. We saw the big 5 again. H-7 before Nsemani leopard was stalking Impala; at Nsemani dam two big male lions and one lioness mating pairs on the road for 3 hours; elephants bathing; cheetahs on the road to Olifants. We have been seeing herds of elephants on Marula road and Hippo and Crocodile in the Olifants River. There are plenty giraffe at the moment. 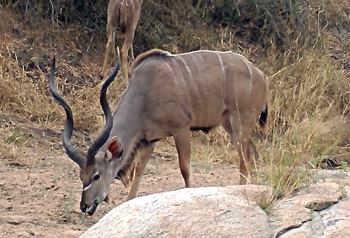 Kudu are common. Zebra have increased in number. A herd of elephants is seen regularly on Rome 1 property. Two hyena are also seen regularly on Barnard property along the Ngwenya Dam road. On 4 Sept we had 4 big Bull Elephants on Maroela Extension and 2 black rhino. Herd of elephants Kambakya dam and pride of 8 lions Maithangi road. Male leopard on Rome 1. On the 30th of august, there was a herd of elephant at Tremisana Lodge – some broke in through our fence right next to my room. The electric fence 7500 Volts didn’t stop them as they were hungry. On the 9 September in Kruger there were two leopards with kills on the Orpen road just before the reception, the one has killed an impala while the other one was busy eating a warthog. On the 15, we found a leopard on Rome 1 – it was trying to catch an impala. Unfortunately the wind was blowing all around them and the impala smelled him and starting they alarm call sound – some saw him, he was very close to one of them. On the 21st we got a breeding herd of over 100 elephants crossing the road in front of us at Nsemane Dam. 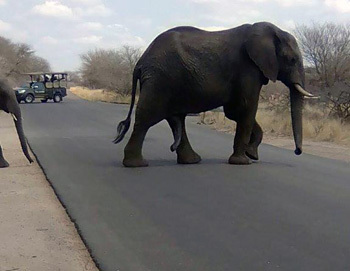 A Viva vehicle keeps a respectful distance from elephant herd crossing the road. On the 23rd, on the H7, about 8 km from Orpen we found a male leopard trying to catch warthogs very close to the road. Later that day we found another leopard trying to catch an impala. On that very same road just further on, we found 2 lions mating next to the road towards Nsemane Dam. This month we had so many amazing sightings with a big concentration of game around the water holes -tough times for general game and a privilege for the big cats.. The central part of Kruger where Viva drives offers the very best opportunity when it comes to predators. The area around Orpen gate is extremely productive : we regularly find a male leopard : one day with a kill which was a warthog near the road, the next day we found it mating with a young female leopard just next to the road which was a highlight of the day as it is not easy to see them mating. We also got 3 white rhinos grazing next to the road. 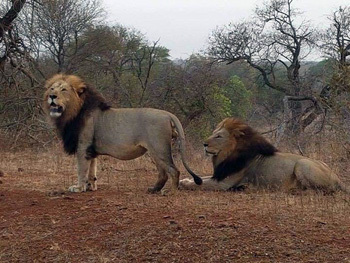 There are two male lions which form part of the pride of 17 near Phelwane Bridge. This pride specializes in killing buffalo in the water pool along the Timbavati river, they took two buffaloes in the space of 3 days ! The buffalos are force to come drink in that area as there is water shortage all over. Beautiful males of the Phelwane pride. We managed to crack a really rare sighting this month : four cheetahs killing an impala in an open area Sweni road. We managed to get them several times. Nwanetsi River near Satara has a male leopard often moving around there. Three lionesses with 5 cubs of about 6 months old are also seen regularly. Wild Dogs are common around Orpen – as a result we called them the Orpen pack. We found them with puppies all over the road – very playful and the older dogs had so much blood on their faces – they had just killed an impala. 6th : Lions with the cubs on S100 that was beautiful, elephants all over, buffalos S100, more general game H7. 10th : White rhinos near reception and elephants plus buffaloes before second Orpen gate, more elephants the first view point on H7,more general game Timbavati riverbed, leopard Nwanetsi bridge and loins Sweni windmill lying down. 23rd : White rhinos at start, buffaloes Rabelais road, lioness Timbavati riverbed and elephants Nsemani dam washing and more general game north of Satara before S90. 27th : Lions before Nkaya pan, cheetah close by, elephants Sweni windmill, leopard on S 39 road and more general game on 39 road, buffaloes Rabelais road. 28th : Lions before Ngotso dam, 2 leopards Sonop windmill,, buffaloes Timbavati riverbed, rhinos near Orpen, leopard up a tree and white rhino crossing in front of the car and hyenas with the babies on the road. September 2017 will be remembered as a brilliant month for animal sightings – let’s hope October will also be the same. Good day to all the readers – what a month we had as season is changing. Experiencing some cold weather at the moment – So safari lovers remember a coat of some sort. So off to Kruger and on the way we found buffalo dagga boys – 2 out of 5 and we haven’t yet left Camp ! Driving down H7 we found loads of general game including Giraffe, Kudu, Zebra, Waterbuck and loads of different bird species including Burchells Coucal, Martial Eagle, African Fish Eagle and Purple Roller. Wow ! So far what a day we already had. We got Elephants as well along the Timbavati River with a huge herd off Buffalo Lying down next to the road. What we didn’t know was that there were 2 male lions waiting on the other side off the river. What a sighting as they started stalking the buffalo ! We spent about 40 minutes watching intensely but after a while the lions went to lie down in the shade. Going on towards Nsemani Dam we found a big Elephant breeding herd on the road – we stopped a fair distance as we watched them cross over – what a sight as the excited guests loved being in Africa. :) Coming eventually to the dam we spotted some Male hippos and a big crocodile. There were Baboons in a tree and some Impalas eating the fruit dropped by the baboons. There was also another breeding herd of African Elephants coming down to drink water. After a while we left the sighting and went on to Satara to Go and have Lunch. Well-deserved lunch and off we go towards S100 viewing white rhino sleeping peacefully under a tree. He got up and grazed a bit. After the Rhino we went up North on the S127 viewing cheetah and Kori Bustard – beautiful Bird. Vultures, Eagles of all different species. Elephants, Buffalo, Ostrich with babies. And then then the final a few Km on to the S39 a Gorgeous Leopard with a Cub lying in a tree a few metres away from her they had a kill which we couldn’t identify but what an amazing sighting !! We then had a thrilling unexpected encounter with the endangered Wild Dog. They ran in the road as a pack playing with each other and then went over and down the road off into the bush such a quick sighting but wow. That was on the H7 back towards Orpen Gate. As we get to the gate another rhino sighting. In the end it was a perfect Africa day for me and was such a wonderful experience to have seen all those beautiful animals in one day. So happy and blessed to work in Africa!! So as I always say no day in Kruger is ever the same and that’s why so many people keep going back to Kruger to get those Unique sightings. We began the day with buffalo at marc’s camp. Arriving at Kruger we got a Leopard with an Impala kill in the tree. On the H7 we saw loads off general game including different bird species – we also got to see Elephants drinking water, a Hyena den where the mother was out and the cubs were playing around the den area – such a touching sighting seeing these youngsters! Further on we got 2 big male lions lying down next to the side of the road. At Nsemani dam we saw Hippo, Crocodiles, Zebra, Giraffe, African fish eagle, vultures and loads more around the dam. We went on to S100 where we found White Rhino lying down and a big buffalo herd which was busy crossing the road. We found another 2 big female lions lying down. As new camp manager just want to thank Viva Safaris for taking me in and making me part of the team here – I feel at home and am enjoying every moment. This month has been very busy and productive one as the lodge is running at peak level. I’m happy to assist every day in some sort of activity too and this helps as to learn more about the farm, all our lovely guests and staff working here. I have been doing walks on the beautiful Olifants River and every time has been unique and awesome – learning about the bush and animals. Our experienced guides do a very good job in keeping guests safe. It’s always a highlight to see hippos and crocodiles in the stunning river. In my second week at the lodge, in the early hours of the morning I got a call from guests saying something big was walking in centre of the lodge. After tip toeing around I found two great big bull elephants. I have worked with Elephants before and had no fear to chase them out but these Elephants had no fear of humans and meant business. Eventually had to get my hand gun and shoot few shots off to get them out – it’s been a real learning curve but I loved every moment. The presence of a young Black Rhino bull has caused a lot of excitement along with some concern. I spoke to JP, the warden of Motlala Game Reserve, of which Marc’s forms a part, and I was told that this young male rhino is actually trying to hide from the dominant Black Rhino bull that wants to kill him. So he has sought shelter in the vicinity of human activity. The dominant bull apparently shies away from humans ( thank God for that ) and we are seeing the young bull every day. He is reasonably relaxed but must NOT be approached as he may interpret a direct movement towards him as a challenge and may react aggressively. It is great that he is around as sometimes our Kruger trips do not yield rhino sightings. Another scary story : the occupants of treehouse 1 awoke on the 23rd September and while climbing down the steps of their treehouse, saw a lioness slink away into the reeds of the Klaserie River. What with the regular presence of buffalo and occasional presence of leopard, our guests must always be vigilant. It’s a good thing that there are no elephants at Marc’s. At Tremisana the elephants twice broke through the electrified fence in September 2017. They are extremely hungry and those Strelizias are very palatable and juicy ! They are also extremely intelligent. On both occasions, they knocked a branch down and it touched the fence thereby earthing the electric potential and allowing relatively shock-free entry. They did a bit of damage including smashing up a 22 year old palm tree. We have erected thatch umbrellas on some of the decks – in some cases the trees growing through the decks were well established and provide natural shade. We have built a 2m x 2m base on which we will be placing a 1500 litre water tank. The water will be brought in and used for the fancy Italian coffee machine and the new oven. We were told not to use borehole water as the machines are too delicate for the dissolved chemicals. A small-spotted Genet has been visiting us at dinner time. She is clearly used to lodge life. 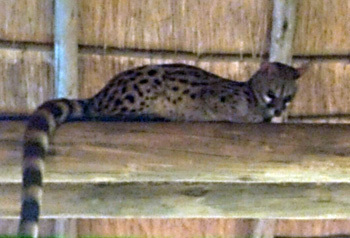 Small-spotted genet watching guests at dinner. We had a good month yet again – thanks to our loyal agents! With the absence of rain, our tourists have had great sightings all month. We have had great reviews as well as wonderful comments in all our Guest Books. Until it rains, we can expect the sightings to remain very good as the animals are forced to congregate around the water points. FANTASTIC – Once in a lifetime Safari adventure !!! A fantastic safari adventure that lived up to all our expectations. We chose the 6-day safari, staying at Tremisana lodge. The accommodation was basic but clean; good enough for somewhere to lay your head after a long day in the bush. The food was great, catering very well for vegetarians. 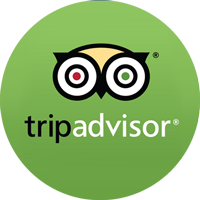 All the staff at the lodge were extremely friendly & helpful & the guides from Viva Safari were superb, knowledgeable & enthusiastic. As soon as we arrived we were straight into the adventure with our first sunset drive & bush BBQ, spotting giraffe & rhino & not to forget Impala’s; it was a wonderful start. With 2 trips to Kruger National park, a visit to the Moholoholo rehabilitation centre, an evening drive in Tshukudu game reserve we saw just about everything! The highlight of the safari for us was being surrounded by 30 to 40 elephants crossing the road all around our jeep, some almost within touching distance. To witness these gentle giants so close up in their natural habitat was truly amazing. We’d like to give a special thank you to Pretty who organised everything for us at Tremisana lodge, Ed for rescuing us on the final Saturday morning & Mayneith for his fantastic trips to Kruger National Park. Finally, we’d like to say a massive thank you to Eva who was for most our guide at Tremisana lodge. Your enthusiasm, knowledge, humour & driving made our safari experience unforgettable. For a family looking for their first safari experience I would highly recommend Viva Safari’s and Tremisana Lodge. We visited the Katekani Tented Lodge for a 5-day safari. Our excellent guides showed us around a lot of reserves. Their excellent eye caught a verity of animals including the big 5, an amazing view of a leopard eating and a lot of small and big animals. Their vast knowledge of the bush and animal behaviour made our trip a delight! Thanks Nico, Charl, Rex and Raymond for an amazing ride! The lodge was beautiful. Every cottage has a lot of privacy, indoor bath, shower an outdoor shower and a small pool. Every part of the lodge was very well maintained and in great condition. Excellent coffee and tea in the room made the package perfect. Katekani has a restaurant level food. Every day Henry (thanks Henry) the chef would make delicious breakfast and dinner served with care and delight. I can’t stress how good the food in this place is. We did a 5-day safari, driving on very rough roads and we didn’t have a single glitch. All vehicles and equipment were very well kept and were as comfortable as can be. Do yourself a favour and choose Viva safari and the Katekani lodge for your safari experience. They are amazing. We spent 4 memorable nights at a treehouse cottage, It was well equipped and clean with adequate bath facilities. The people are wonderful here, always very kind and helpful, provide a great South African feeling and hospitality. We had our porch looking at the river, one morning we were looking a black rhino right there at our cottage! And many unafraid nyala antelope every morning within the camp. Nice breakfast and dinner with South African dishes and always with a twist! Monkeys are there but looked after with sticks… really tropical feeling. We experienced excellent service, quick response to our mails and questions and flexible possibilities. Booking process was easy and clear, the safari itself was magnificent. We had very kind and passionate guides who did the best they could to give us an unforgettable experience…and they succeeded!